Pope Francis arrives in Philadelphia Saturday for a historic visit that will include public speeches and the celebration of Mass on the Benjamin Franklin Parkway. With his arrival comes unprecedented security coverage that includes the virtual closure of the city's core, major interstates and more. Traffic boxes will go into effect in Center City and West Philly tonight. Where's the Pope: Travels to Washington D.C. from Cuba — Arrives at 4 p.m.
What's happening in Philly: The World Meeting of Families conference begins and a new round of parking restrictions go into effect around Independence Mall. Parking Restrictions: "No Parking" zones expand east at 6 p.m. from 12th Street to 3rd in Market East, Old City, and Independence Mall. (Here's a map) Vehicles will be towed from the area if an extended parking placard isn't displayed. This expansion makes street parking in Center City — without a special placard — virtually impossible. Garages should remain open during this time. More on parking here. Cars parked in Pope security zones will need to begin moving on Sept. 20 -- unless residents purchase a $20 placard that will extend their street parking time and grant them access to a garage. Where can I go? : You should still be able to navigate the city — with the exception of the area around the Benjamin Franklin Parkway where preps are underway for the outdoor events. What's happening in Philly: Parking is banned on streets in Center City and University City deemed emergency routes for the visit. Parking Restrictions: Starting at 9 a.m., vehicles parked on emergency routes must be moved or they will be towed. Like all parking restrictions, they will remain in effect until Monday. Here's a map, and below is a list. Where can I go? : Most of the restrictions are still limited to parking on streets, so you should still be able to traverse the area without issue — though there will probably be traffic congestion around the event locations. 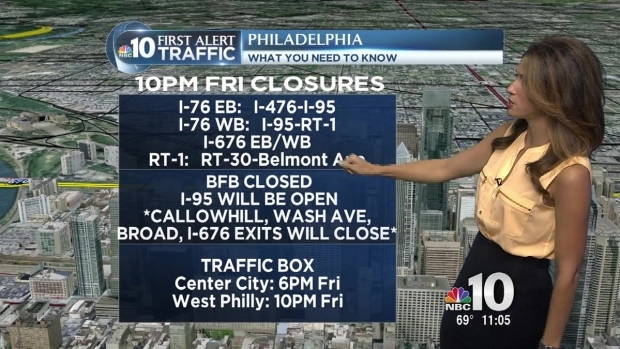 What's happening in Philly: By Thursday night, street closures begin to amp up. The first secure perimeters and true restrictions go into effect around the Parkway and City Hall. Only people who live and work along the Parkway and around Logan Square will be allowed into that area. Security screenings will be in effect. Street parking is no longer allowed. This zone starts at City Hall and zigzags up to the Philadelphia Museum of Art. The first secure vehicle perimeter goes into effect as well. Street parking will be prohibited. Parking Restrictions: Residents who purchased street parking placards for this week must either move their vehicles into city-owned garages or out of the area. 2, 4, 7, 9, 12, 16, 17, 21, 23, 27, 31, 32, 33, 38, 42, 43, 44, 47, 47M, 48, 57, 61, 62, 78, 124, 125, Broad Street Line Night Owl and Market-Frankford Line Night Owl. Where can I go? : You will still be able to travel through most of the area with the exception of the secure perimeter around the Parkway. What's happening in Philly: The public will be permitted into the secure perimeter, roads will be closed and by the evening, the traffic box will go into effect. 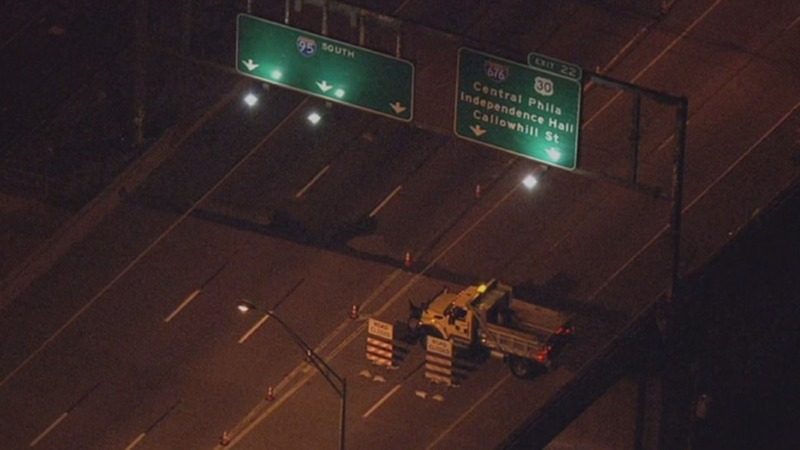 The major interstates and Ben Franklin Bridge will also shut down. People will be able to enter the security perimeter from 20th Street to 12th Street after being swept by security personnel. This will include going through a metal detector. Areas to the west of 20th Street will remain closed through Saturday. Traffic on Authorized Vehicle Routes (the ones cleared of parking earlier in the week) will be barred for public use. The traffic box is activated in Center City. It stretches from Girard Avenue/Ridge Avenue and Spring Garden Street in the north to South Street in the south and river to river east and west. The University City traffic box goes into effect. It is bounded to the west by 34th Street, Powelton to the north, University to the south and the Schuylkill River on the eastern side. The same vehicle restrictions apply. A new, second secure perimeter begins around Independence Mall. Again, only people living or working in this area will be allowed inside. The secure vehicle perimeter will also extend from 12th Street to 3rd Street. This means there will be no street parking allowed in that area. The Benjamin Franklin Bridge will shut down at 10 p.m. and be closed overnight for conversion into a pedestrian bridge. Public Transit: SEPTA stations in Center City closed Thursday night will remain shut down. All Regional Rail lines will operate on a Saturday schedule. Where can I go? : You'll have to rely on pedal power or your two feet to get around inside Center City and University City because driving — even if you have a car inside the traffic box — is going to be tough. Driving to the city on highways will become very difficult at this point. You'll be free to move around South and North Philadelphia and other neighborhoods, but expect delays the closer you get to the traffic box. Where's the Pope: Philadelphia — He'll travel to the city in the morning, celebrate Mass at the Cathedral Basilica of Sts. Peter & Paul, deliver a speech at Independence Mall and take part in the Festival of Families on the Parkway. What's happening in Philly: Pope Francis will be moving around the city for the first day of papal events. Secure zones will be opened to the public and screenings will begin early in the morning. Taxis will no longer be permitted to travel into and out of the traffic box. SEPTA will convert rail service to special papal event service only. Bus service outside of the security zone will continue to operate. Security screenings will begin at both secure sites — along the Benjamin Franklin Parkway and at Independence Mall. U.S. 1 (City Avenue) will close from U.S. 30 (Lancaster Avenue) around St. Charles Borromeo Seminary to Belmont Avenue. It will reopen at 10 p.m. and then close again on Sunday morning. Pope Francis arrives at Atlantic Aviation inside Philadelphia International Airport. He will then travel to Center City for his first event. The pope will celebrate Mass at the Cathedral Basilica of Sts. Peter and Paul at Logan Square. Pope Francis will travel in the Popemobile through Center City to Independence Mall where he will deliver remarks. Security screening will end at Independence Mall. The area will be reopened to the public, but vehicle restrictions will remain in place. The pontiff will arrive at the Festival of Families — the outdoor concert featuring major musical acts — on the Benjamin Franklin Parkway. At least 500,000 people are expected to attend. The Festival of Families will end. Event attendees will make their way back to hotels and flood SEPTA stations. U.S. 1 (City Avenue) between Lancaster Avenue and Belmont Avenue will reopen for the night. Public Transit: Only passengers who purchased special papal passes will be permitted to ride Regional Rail. The regional rail passes have designated times for use. The Market-Frankford El and Broad Street Subway will operate with enhanced service. Only certain stations will be open. Overnight OWL service will not be offered. Bus routes outside of the traffic box will remain unaffected. Routes that travel through the box may be truncated. Where can I go? 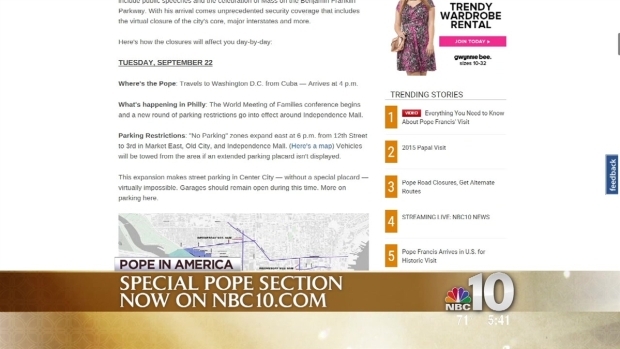 : If you aren't planning to attend a papal event, then avoid the area. Should the expected number of attendees arrive, moving about downtown — even on foot — could be difficult. Areas outside the traffic box should be fine, but with highways closed, expect delays. Where's the Pope: Philadelphia — Highlights will include a visit to the city's jail and the celebration of Mass on the Benjamin Franklin Parkway. What's happening in Philly: The city is bracing for an influx of 1 million people hoping to take part in the celebration of Mass by Pope Francis. Special SEPTA regional rail service begins running for the day. Security screenings will begin on the Benjamin Franklin Parkway. U.S. 1 (City Avenue) between U.S. 30 (Lancaster Avenue) and Belmont Avenue will close until the afternoon. The exact reopening time has not yet been determined. Pope Francis will leave St. Charles Borromeo for Curran-Fromhold Correctional Facility in Northeast Philadelphia to meet with inmates. Pope Francis will travel in the Popemobile down the Benjamin Franklin Parkway. He will then celebrate Mass from a stage and altar in Eakin's Oval. The Parkway is only expected to hold a few hundred thousand people. Others will spill down side streets and through the city's core. Mass attendees will begin to depart the Parkway area. Public transit stations and main walking routes will again be flooded with people heading home or to their hotels. Pope Francis will arrive at a VIP reception inside Atlantic Aviation at the airport. Pope Francis will depart for Rome. Where can I go? : Just like Saturday, traveling through Center City will be difficult. Events will wrap up earlier than Saturday, but more visitors could be downtown extending travel times. What's happening in Philly: The cleanup is underway! Travel restrictions will be lifted as the overnight progresses. Taxi service into and out of the traffic box will resume. Public transit will start resuming normal operations. Though SEPTA's regional rail lines will be operating on a Saturday schedule. The traffic box and parking restrictions will be lifted, but the removal of barriers and fencing will continue in areas where papal events have taken place.